I’m so excited to finally share our little girl’s nursery with you! Sure, she’ll just be a little baby who sleeps, and poops, and spits up everywhere. And for the first couple of months, she’ll actually be snoozing away the nights (fingers crossed!) in a bassinet in our bedroom, rather than in her crib you see here. 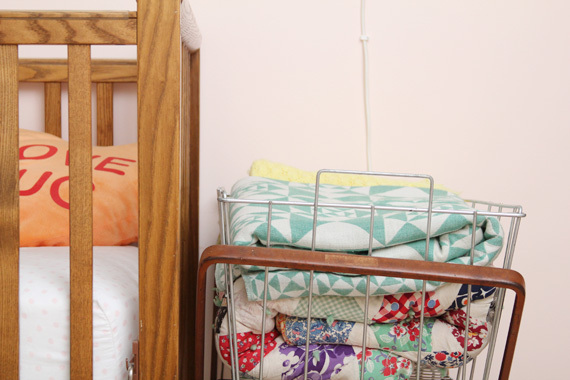 But still, it was so fulfilling to put together a fun, friendly, and cute little room for our little girl who will surely have all of those characteristics and more! I hope we can spend lots of time in here, reading together, playing pretend, watching the squirrels run through the backyard, and wave at the trains that go by. 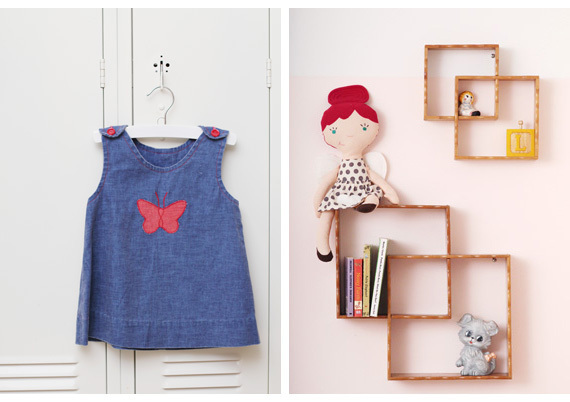 Hopefully she will love her room, and when she’s old enough, together we can add special touches of her own. As an interior design school graduate, and a person who just generally loves to decorate, I was sort of super bummed out by the tiny bit of our budget we were able to allot for putting together a nursery. I told myself it didn’t matter. I reminded myself that babies don’t care about nurseries, and that I shouldn’t either… but none of those things worked. I still found myself obsessing over this project, and somehow managing to pull everything together on a shoestring budget. I feel pleased and blessed to be so happy with the little space. And now I have motivation to turn my attention to planning the decor of the rest of our home. Our drop-rail on the crib is currently facing the wall, and will be bolted to disable that feature. The art hanging above the crib is securely fixed with heavy-duty foam tape. The chord for the balloon lamp on the crib wall has been secured to the wall with coax staples. The flooring in our home is terrazzo, which is marble chips laid into cement and sealed. I shared some planning details for this room at this post and this post. Below, I’ve noted where items were purchased/how they were revamped. I adore every single thing down to the last detail! Your little girl is so lucky! My favorite things are the books on the wall, the girl hanger, the little boxes on the wall, and the white locker as storage. Amazing job! Now settle down mamma, you have to rest! It Looks fantastic! You did a great job with your small budget. Wow, this nursery is SO cute. You did an amazing job. Can I live in there? I love love love it!!! It’s so great!!!! it is soooo cute!! i love the lockers! I love it. Such amazing finds. I love how she will be able to grow into the space. Excellent job! see, your gift for decorating places amazes me, and this is so gorgeous. I love the shelves, the furniture (the lockers are great), the art, everything!!!!!!!!!!!!!!!!!!! Come decorate my boys’ room. It’s boring. Nothing on their walls at all. I can’t wait to decorate a boy’s room someday- because it would be a real challenge for me, probably. I thought it might be fun to do some western themes, just because I really loved playing Zoro type of imagination games when I was a kiddo. Every single detail is really, really wonderful. It may have been done with a little budget, but it looks absolutely priceless! This is SOOO cute! I love it! And its always so much more satisfying when you’re forced to be creative and use your imagination to bring things together. Its so sweet and vintage and a room that will easily grow with her. 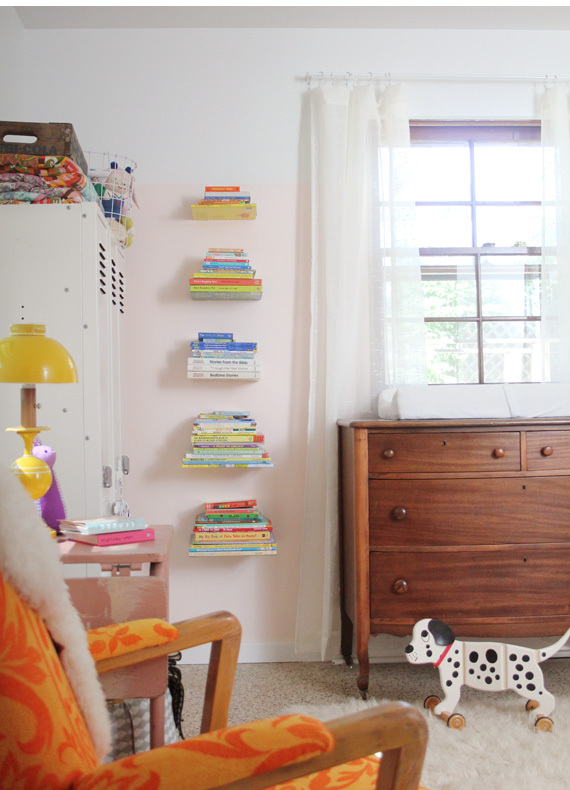 We also used an old family dresser in our nursery, and I love it! After our girl outgrew the changing table, it became just her normal dresser and she keeps her treasures and ‘fine jewelry’ on the top. She’s also inherited my love of decorating at all of 5 years old, and its so funny to see them develop their own tastes and style! Oh, it’s charming! I really love the vintage furniture you’re using. We also used a vintage drop-side crib but the construction on ours (built by my dad for me in the 70’s) makes it impossible for the drop side to detach unless the baby literally ripped the screws from the wood (which would cause a danger even in a non-drop-side). I think a lot of the dangerous drop-side cribs were ones built with plastic parts holding the drop side in place. As usual, older stuff is built to last. :) Even though our baby didn’t sleep in the nursery much, I really enjoyed nursing and playing with her in there. I don’t think you’ll regret having the space designated for her! We’re not making a nursery for our 2nd because we think the guest room will be more valuable real estate for the first year, but I am looking forward to decorating another big girl room in a couple years! 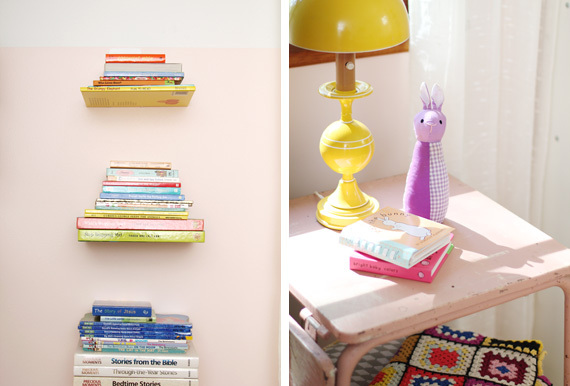 I also love the look of the floating bookshelves…great space-saver for a small nursery! 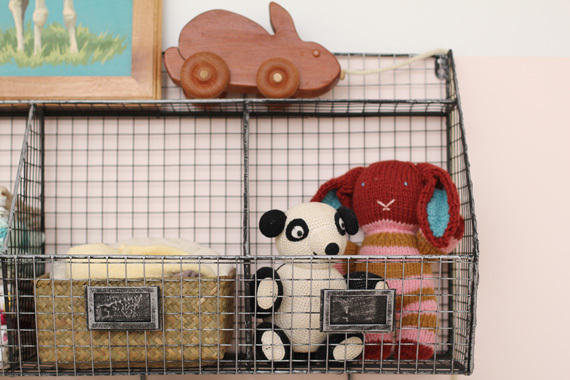 One babyproofing aspect you may want to consider is replacing the books on the bottom shelf or two with soft toys when your little one is mobile, as a young baby pulling up could bring a pile of books crashing down on her head. Thanks, Hillary! I did consider how practical those book shelves will be, and I’m not sure if we will keep them in there in the future, for reasons you mentioned, but also… here’s fun one: my little cousin was playing in the nursery and was trying to climb on them! haha! Didn’t expect that one, though I should’ve. This is so beautiful! It looks like something from a magazine. Wonderful! this has to be one of the cutest nurseries i have every seen. you all did such a great job putting it together. Lovely! I’m smitten with the dalmation, but the whole room has such a peaceful feel; I’ll bet your little girl will love growing up in it. It looks fabulous! 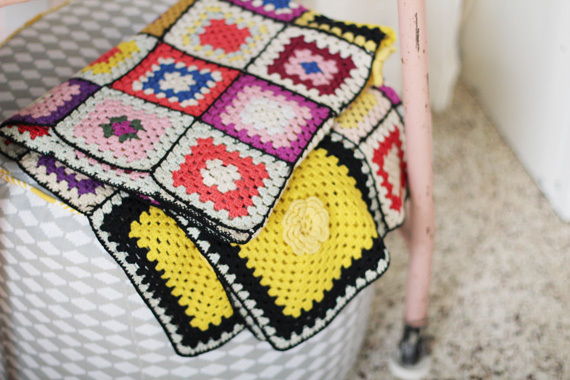 I love all the pops of color and sweet vintage details. I would expect nothing less from you. Perfection. wonderful job! i love everything about this. i have a question about the wire shoveling unit. is it from a marshalls store? do you know how much it cost? thanks! It’s SO beautiful, mandi! i’m so impressed + happy for you too! Love the vintage eclectic look! I could never make a bunch of stuff that didn’t come together look nice! Wow – any baby would be gaga over this nursery! 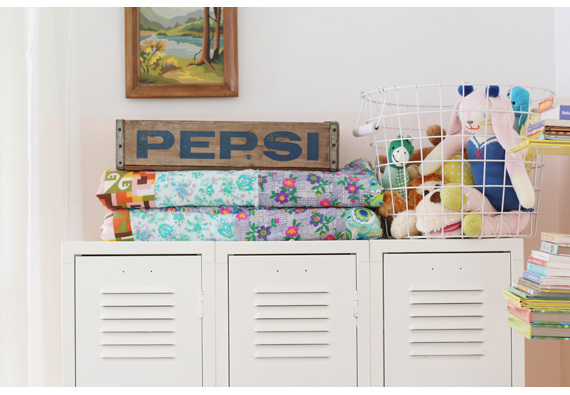 I have the same “try a little kindness” embroidery and Raggedy Ann & Andy chalkboard (minus the stand)! Fabulous vintage touches and color. Oh my goodness! I have been dying to see the finished nursery since you posted a bit about your plans. I love how vintagey the whole thing feels and that it was done on a shoestring. (We too have a tiny budget for our nursery; especially since we had to just go out and buy a sleeper sofa because the baby will be forcing guests out of the spare room! ;) I really adore the soft wall color too. I think there will be a lot of room for her to grow with this decor, and as it gets swapped out for this she wants can easily be repurposed into other areas of the house. Beautiful job!!! I adore ever single detail! Is the dresser going to double as a changing table? So cute! You did such a great job! I’m jealous of the lockers. They’re going to come in handy! How did you hang the books on the wall. What a great room! Thanks, Jan! The bookshelves I used at the Umbra Conceal Shelves, found at Amazon. first of all…I wish I could be your daughter. I want to live & dream in this room! The clothes may be a tad small but i’m short haha…kidding! My favorite has got to be the locker doors, floating shelves and your pouf. UHHH-MAZ–ING !!! I just came over from Pinterest. This is one of the cutest rooms ever! I love all of the vintage components – especially the painted lockers. Absolutely adorable! you should be so proud, it’s a lovely room to begin your life in! lovely soft visuals everywhere..i wish this had of been my 1st room! This room is really beautiful. 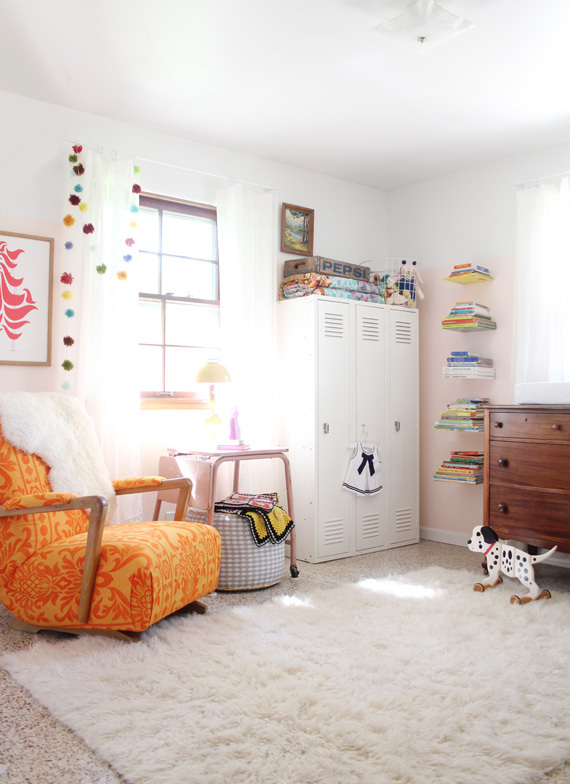 I love all the little details present across the room and I think the challenge of making a child’s room without falling into the cliché of a room too “childish” is really successful. Congratulations for this work. I love the rocker. I used to have one in blue velvet….sadly it was loved to death. I would love another! I wanted to pin the picture that featured the chair but no luck! Where can I find a tutorial on how to make that adorable pom pom bunting(?) hanging from the windows? I want some! Woohoo!!! I’m having visions of a pink monochromatic strand of poms. Looking forward to it! it’s beautiful mandi!!! that pink typist table is just super sweet. now, i am itching to find one! i just know your little girl will love it! It’s sad you have to put all the notes in…knowing that people are going to jump all over your case about everything. 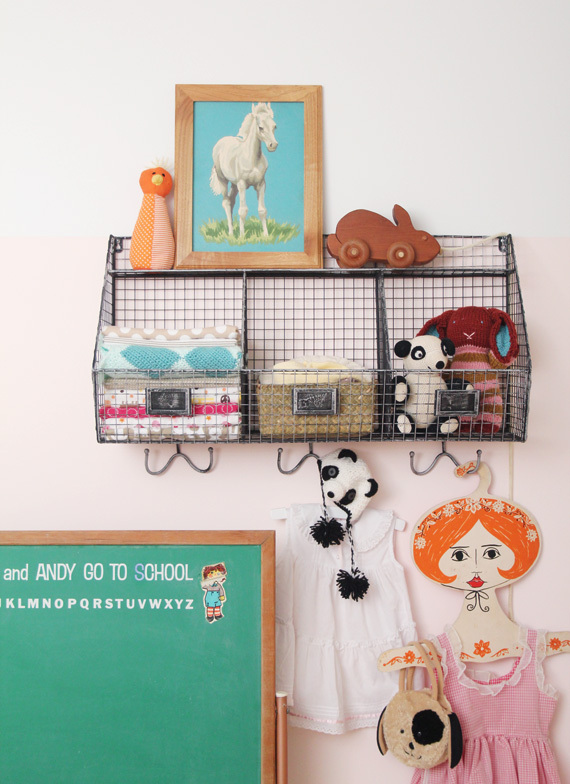 It’s really the most perfect, sweet little nursery. I adore it. This is adorable. You need to pick your father’s brain and give us a how-to on painting lockers. I just put the 5th(!) coat on a set I’m re-doing. I’m keeping my fingers crossed they’ll turn out, but painting metal is tricky. haha This makes me laugh…. and I will tell you why. (long story) This was supposed to be a father-daughter project, like most of our projects are. Of course, I couldn’t do the painting, because I’m pregnant. But together, we went to look at the blue lockers. I thought I liked the peacock blue, as long as I got a set of three that were in good shape (there were like 15 available). The problem is, all of the lockers were hooked together (sharing side panels), except for three. Which are the ones I bought. Of course, the three I bought were in the worst shape, missing one handle, banged up on the side, and majorly in need of a paint job. Dad said, “I can sandblast them and spray paint them for you.” No biggie, right? Well, a month later, he finally had them finished. Turns out, sandblasting the metal (except for the doors) was warping the sheet metal, so he had to use a very labor intensive process of using chemicals and very fine grit sandpaper to remove the blue paint. He disassembled all of the lockers, stripped some screws (accidentally- they were in there tightly), decided he should get all new screws, and so was working with the bare bones- stripped metal, laying in pieces across his backyard. He had to paint them immediately before the sheet metal rusted, so he used his spray booth (he has an air compressor and a spray gun that he puts diluted paint into and sprays very light coats, to avoid drippage) to prime, and then paint all of the pieces. Very tedious. Especially since I selected a different color for the inside. Then, after all of the coats of paint had dried and cured, he had to reassemble the whole beast, using the new screws and bolts he purchased, and at that time was able to rearrange the walls so that the dented pieces were on the inside of the lockers. This is so adorable! 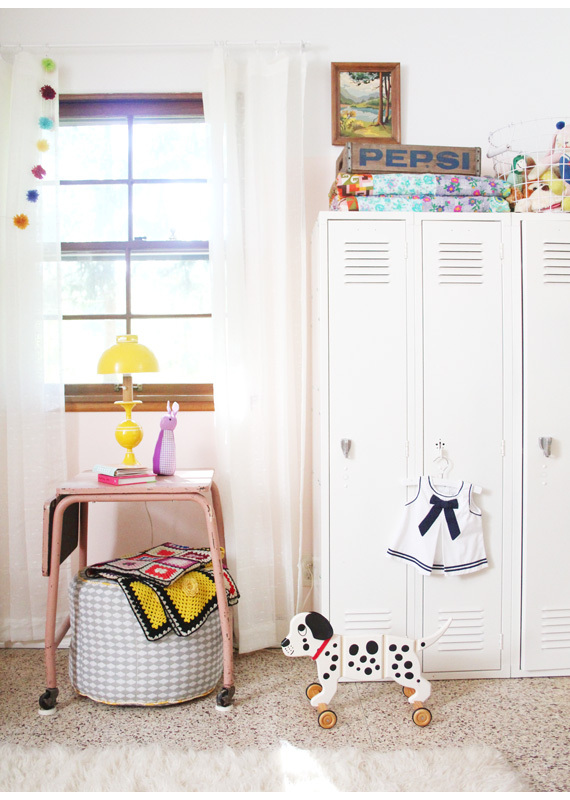 I love every little detail in here (and I LOVE that little sailor dress… I want one in my size!). Seriously, I wish it was my room (care to adopt a 22-year-old? :P). Love it all so much, you pulled it together wonderfully! So sweet! I can’t believe you accomplished all of this on a budget!! It is so beautifully put together without being too cutesy. Really, fantastic job. I have no doubt that the lucky little lady that will be sleeping here will absolutely adore it. I’ve been meticulously scanning all of the pictures to be able to remember all the fun details, but I guess that’s what pinterest is for! so lovely!! what a lucky little girl. can’t wait to hear her name…. I just noticed the two colors of the walls, it makes the room even more beautiful in my eyes. This is amazing. Seriously, truly amazing. I’d love a room like this in our home. Yay! The nursery looks great! My favorite detail is definitely the lockers! So adorable! Lovely :) We’re excited right along with you. You’re right! Creativity seems to flourish when you put restraints on someone. Or at least, I work better that way. :) You’ll have to pop back in and share the link to your bedroom when you’re finished! I’d be eager to see it. What great finds. The room is awesome! Can I move into this nursery?! Love love love it! Oh well done! It’s so fun and cozy at the same time. I’m really loving all the little details and the big white rug looks so soft! Lovely little room. I always wanted a super rad room when I was a kid and totally dreamed about how cool it would be to live in an attic type space. Now my little daughter has an attic room in red and turquoise that I just love! She’s not even two yet, so I’m pretty sure she doesn’t really care, but it doesn’t matter. She’ll love it someday, and I’m happy to enjoy the space when spending time with her there. I have a few more touches to make on the room and will hopefully post about it once it’s good and done! Thanks–love your blog! Just found it today! Lovely decor. What is the total cost of all the items? 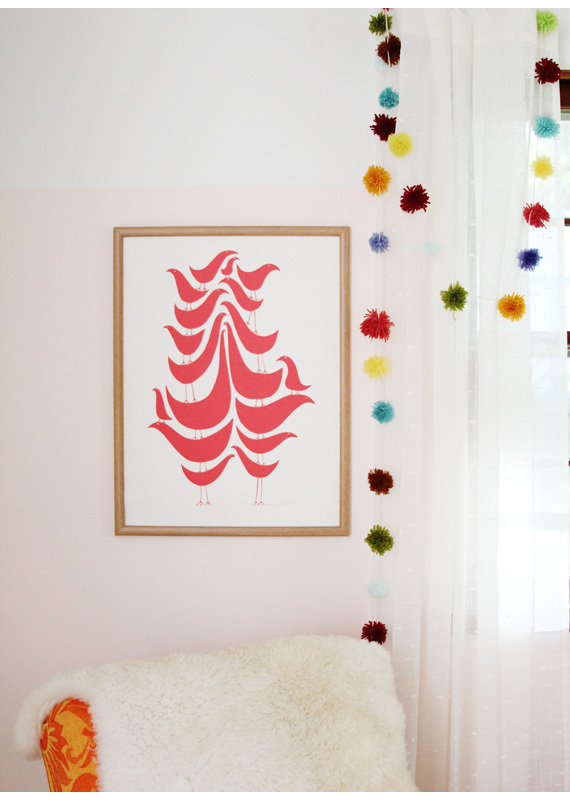 just having fun poking around your blog here…love what you did with the nursery…so, so cute!